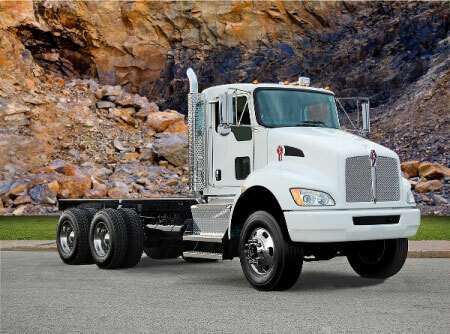 Kenworth introduced 2 new versions of its popular model. First of them is 6x6 configuration for the Kenworth T370 medium duty model. The Kenworth T370 6x6 features a factory-installed front drive axle available in ratings ranging from 10,000 lbs. to 16,000 lbs. The 6x6 will be equipped with a 40,000 lb. rated rear suspension. Initially, the Chalmers series 854-40 suspension will be offered, followed by the addition of the Hendrickson PRIMAAX® EX rear air suspension later this year. T370 6x6 customers can choose either the PACCAR PX-6 or PACCAR PX-8 engine. Kenworth Truck Company announced also a new Kenworth T660 regional hauler configuration with shorter wheelbases, tighter chassis packaging, enhanced maneuverability and weight savings. This is all accomplished while maintaining the same fuel tank capacity as a T660 with forward chassis fairings. “This new Kenworth T660 option is especially useful for regional haulers interested in operating aerodynamic trucks to help increase fuel efficiency and reduce fuel costs,” said Preston Feight, Kenworth chief engineer. “The Kenworth T660 regional hauler configuration offers the same styling and lighting advantages – and similar aerodynamic advantages – as the standard T660 with the maneuverability and fuel capacity of the Kenworth T800.” The new T660 configuration removes the standard under-cab chassis fairing and replaces it with a cab-mounted extension of the hood fender. This allows larger diameter 24.5-inch and 28.5-inch fuel tanks to fit under the cab. Previously, only 22.5-inch tanks fit in that space. The new configuration also reduces weight by at least 250 pounds from a comparably equipped Kenworth T660 with forward fairings, providing the truck with more payload carrying capacity.